60th BN in an advanced post. BATTLE OF HILL 60: Book Excerpt From "Courage, Sacrifice and Betrayal"
It wasn’t much of a hill. Although located 60 meters above sea level, Hill 60 was just 10 metres high and barely four city blocks in area. It looked more like a knoll than a key observation post that the Germans and Allied forces would contest for four long and gruelling years. It was the graveyard for thousands of soldiers, many just teenagers. The Ypres-Comines Railway ran through a cutting just to the east of the hill. With its lack of vegetation and large craters formed from exploded underground mines, the hill looked more like the surface of the moon than a pile of railway cuttings overgrown with grass. This was the world that Platoon Commander Lieutenant Robert Matthew and his Second-in-Command Sergeant Edward Pyves and their men entered on the night of 11 August 1916, as part of B Company, 60th Battalion – Victoria Rifles of Canada. Approaching the Canadian held trenches at the base of Hill 60, Edward could smell the sickening sweet fragrance of decaying bodies churned up in no man’s land. B Company was deployed in Trenches 42 through 44 as well as in Support Posts 45 and 46 with Lieutenant Matthew’s platoon positioned in a crater considered by Captain Ivan Ralston, in command of B Company, to be the most important part of his company’s frontage. Once awake, Edward found the silence of the early morning unsettling. The quiet didn’t last long. At 8:00 a.m., the enemy started to bombard the front line over a front of 2,000 yards. By 8:30 a.m., an orchestra of German 77mm, 4.2-inch, and 5.9-inch high explosive shells along with their heavy trench mortars known as “minenwerfers” built to a crescendo. Soon the deep bass notes coming from the Canadian 12-inch guns intermingled with the German symphony signalling the delivery of a barrage aimed at both the front and rear of the German front line trenches. At 11:00 a.m. Edward peered cautiously over the parapet. Through the drifting clouds of gray smoke he saw strong battle patrols moving out from the enemy’s front lines. There were almost 200 Germans quickly approaching their position in two waves. At the sight of the approaching enemy a shiver ran down Edward’s back and he intuitively knew that taking action would help dispel his sense of dread. Edward and his men laid down a rapid fire. They were thankful that the battalion’s Ross rifles notorious for fouling in the muddy trenches had just recently been replaced by the more reliable British made Lee-Enfield rifles. Lieutenant Matthew assisted his men in repelling the attackers in what was one of the worst places in the line. Fearing that they might be overrun, Lieutenant Mathew decided to personally take the risk to travel while under attack to report his tenuous situation to Captain Ralston. Approaching Ralston’s headquarters which was under heavy artillery fire, he took shelter in a trench nearby and was instantly killed by a high explosive shell. With support from the Canadian artillery and machine guns, only a handful of the German soldiers made it to the Canadian front lines. One German managed to get close enough to lob a hand grenade into one of the forward crater posts killing several members of Edward’s platoon. Edward was seriously wounded by the many fragments of the German “Potato Masher” penetrating his body and suffered temporary hearing loss. Although wounded, with the death of Lieutenant Matthew, Edward took charge of the crater posts and assisted in getting up bombs until the attack was driven back. At the eastern end of Trench 38, Acting Sergeant Charles Bryant, Private C. Mann and Private John Gunn bombed out the Germans and then Private Gunn jumped over the parapet and bayoneted one of the raiders. One German NCO, accompanied by several attackers, also penetrated Trench 41 where Sergeant Carl McDowell, although wounded in the hand, threw a bomb at the raiding party killing all of them. Another party of 15 Germans using the sap into the crater outside of Trench 48 successfully bombed out the Canadian Post holding the craters, killing the occupants. They were driven off by machine gun and rifle fire, which had included fire from Edward and his men. Lieutenant H.N. Blake of the 6th Canadian Battery, situated in an Observation Post in The Dump located on the right of Hill 60, moved under fire to Verbranden Molen further west where he successfully tapped into a communications line helping direct battery fire onto the attacking Germans. Once the German attack receded, Edward managed to walk barefoot to a forward medical clearing station as his boots had been blown off his feet in the explosion. 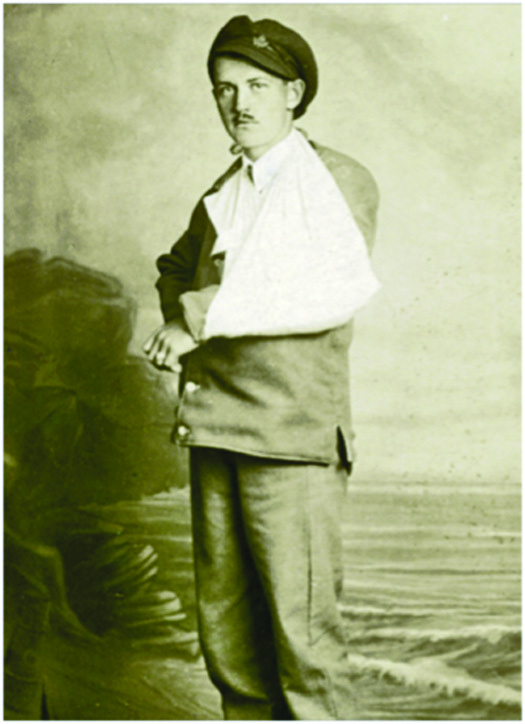 Just three days later he arrived in England and would spend the next two months recovering from his wounds. Sadly, two officers including Lieutenant Arthur Miles King (27-years-old) and 30 “Other Ranks” from the 60th Battalion were killed in the defence of Hill 60. An additional two officers and 56 “Other Ranks” were also wounded that day including Major Claude William Thompson and Major Gordon Alexander Sampson who would later recall: “My duty in France was of short duration. The First and Second Divisions having been transferred to the Somme area, the Third Division was required to take over the entire Canadian frontage of the Ypres Salient, Belgium. We were spread thin, and thus the opportunity for attack by the Germans. It came Saturday August 12, 1916, directed at Hill 60 and within an hour’s time the front line trenches manned by the 60th Battalion to which I was attached was but a series of shell holes. All communications was cut and but one machine gun remained in action. Our battery was covering a part of the line known as the Halt. The Halt was really an old knocked down railway station. On the left of it was the beautiful little lake of Zillebeke and on the right Sanctuary Woods, Maple Copse, and a part of the line known as the Cutting. The Cutting was a deep cut about five hundred yards long, and the banks on each side were about twenty to thirty feet high. It was a dangerous place at any time for those going in or coming out of the line. Well, to get back to my little experience. The main body of Canadian troops were on their way to the Somme and our Battery was to be relieved on the 14th, this was our last trip up the line. The observation officer, the sergeant signaller, another signaller and myself started up on the morning of the twelfth in the best of spirits, never dreaming what we had to go through before we got relieved from this hell-hole of death. The observation officer and the sergeant left us at the Halt. They went to the right on what was known as Zillebeke Ridge; we went along the railway through the cutting up into a part of the line known as Lover’s Lane where we relieved the other two boys from the Battery. The dugout we occupied was part of a dugout used by the tunnellers for keeping their supplies. The first tunneling company at that time was very busy on a large tunnel right under the German lines and the mouth of this tunnel was in front of our dugout; in fact the cutting in this spot was filled high with bags of sand taken out of the tunnel. The dugout we were using was about twenty feet long, six feet high at the entrance and ran back to a point. On the roof were about six to eight feet of mud and sand bags. It was a beautiful morning, and I had just got up and relieved my partner on the phone, O.K.’d the observation officer, and sent word to the Battery that everything was going fine. I was sitting looking out of the dugout door and thinking that in a few more hours we would be relieved and away from the Ypres Salient. While I was thinking, two little canaries attracted my attention. No doubt you know that canaries are used for detecting gas in deep tunnels. Well, these two little birds started a fight over some bird-seed, and as their cage was hanging in the mouth of the dugout I had a good view of the scrap. I was just going to put a mental bet on the one with the black-knot, when Bang! And a big Minniewafer (sic) landed right on the roof of the dugout near the entrance. The poor little bird’s last fight was over. I grabbed the phone and got the O.P. officer on the line and asked him what to do. Things began to get quite lively. Old Fritz was sending over all kinds of stuff by this time and it looked as if we were in for a rough time. He sent word back to get the Battery and send in the S.O.S., which we did. I had no sooner sent it in when another “Bang!” and all our communications were cut off from the outside world. It was a perfect hell outside by this time. He was sending over everything he had and seemed to concentrate everything on our little part, the Cutting, Lover’s Lane and Bensham Road. Our old dugout was rocking like a ship in an angry sea. We expected every minute a big shell would land on it and we would all go up together. My chum and myself got back in the dugout as far as possible, as it was absolutely no use trying to get out to fix the line. The strain of expecting to be buried alive is something I never want to go through again. The two dressing stations farther down the Cutting had both been blown in and they brought the wounded and dying into our dugout. It was sad to see some of the lads they brought in. The Doctor would look at them, inject something into their arm and tell the stretcher bearers to leave them to one side. We all knew what that meant. It spelled “No Hope.” During the time this little drama was being enacted in our dugout, the boys who were left in the line were having a desperate time keeping the Huns out of our front line. He made three desperate efforts that morning to take our trenches, his object being, as we found out afterwards, to get to the mouth of the tunnel and blow it up. He was foiled not by numbers, but by a handful of the bravest of the brave men of the 60th Battalion. This little scrap lasted from eight o’clock till eleven-thirty. Lance Corporal James F. Kelly from B Company and Sergeant Carl McDowell, an American volunteer from A Company, were both awarded the Distinguished Conduct Medal for their actions on August 12. Sergeant Edward Pyves was later awarded the Military Medal on 17 October 1916. Also awarded a Military Medal was Lance Corporal James McCarren. Although not a major battle of WWI, the defence of Hill 60 accounted for the third worst day of casualties for the 60th Battalion in the entire war.